The spring season is under way for the West Elk Soccer Association (WESA) boys U18 club team as they returned to league play with three league games last weekend. In the end, after a couple of draws, WESA found their scoring touch to finish the weekend with a big win. They opened league play with a showdown against down-valley opponent Gunnison. Gunnison has owned the rivalry the past several years and is, once again, proving to be one of the stronger teams in the league, with a 3-0 record heading into the game against WESA. While somewhat overmatched, WESA managed to play to a 0-0 tie with Gunnison, closing the gap slightly between the two clubs. Gunnison opened the game in charge of play with their three central midfielders dictating play and Merlin Mapes causing havoc up top in the striker position. The WESA defense managed to hold off successive attacks as their positioning and one-on-one defense proved solid enough to stave off the Gunnison attack. 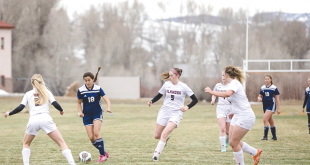 The times Gunnison did break through for open shots, WESA net minder Slater Weil came up with the required saves and after 90 minutes of play the teams were left with a scoreless draw. WESA then hit the road Sunday, May 7 for a doubleheader against FC Fire out of Grand Junction. The doubleheader would prove to be both frustrating and cathartic for WESA as they tied the first game before rolling to a 5-1 win in the second match. WESA established possession and dictated a controlled pace from the opening minute of the first game, setting up numerous shots from outside. The initial strikes missed the mark as shots flew wide of the net or straight to the Grand Junction goalkeeper. Rather than get frustrated, WESA maintained their composure and continued to press. Their patience paid off in the 43rd minute of the first half as Walker Carroll pushed up the flank from his defensive position to play a ball into the six-yard bow. The Grand Junction keeper mishandled the chip-in and Tommy Linehan was there to poke the loose ball by the keeper for a 1-0 lead. A minute later Will Hoskin jumped on a loose ball off a Grand Junction clear and fired a shot through traffic from 30 yards out that squeaked past the Grand Junction goalie for a 2-0 WESA lead at halftime. “We came out really strong with intelligent play and progressed from there—we just couldn’t finish,” says Houseman. Poised to break the game wide open in the second half, WESA instead appeared content with the two-goal advantage as their play turned lackluster. While they still controlled the ball with relative ease and looked to build their attack, hesitancy plagued WESA. Grand Junction was lost at midfield but tight on defense and turned away WESA’s slow attack, clearing the ball up-field to deny any second options on their net. 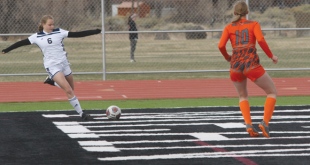 While Grand Junction never managed to build a cohesive attack, they did capitalize on two direct kicks in a span of eight minutes to tie the game 2-2. At this point frustration took over the WESA squad and they struggled to finish on numerous chances in the waning minutes of the game and finished with a frustrating 2-2 tie. A two-hour break and a little introspection from the WESA team provided the necessary spark in the second game of the doubleheader as they cruised to a 5-1 win against the same Grand Junction team. Linehan opened the scoring off an assist from Elior Bilow. Grand Junction tied the game six minutes later but WESA finished the first half with one more goal as Linehan pushed the ball inside to Houseman and Houseman blew by the lone Grand Junction defender to slip the ball into the low corner. Dylan Eaton tapped in a corner kick to put WESA up 3-1 in the third minute of the second half. Liam Reily chased down a ball to the corner to drop it to Carlos Franco, who picked the upper corner with his shot. Jude Eaton did the same 10 minutes later as he picked the ball off the end line and fed Bilow inside the six-yard box for a fifth WESA goal, capping the 5-1 win. WESA will host Gunnison at the Crested Butte Community School field this Saturday, May 13 at 11 a.m.